Gripping History provides memorable and informative historical school visits for children in EYFS through to Key Stage 3 in East Anglia and the East Midlands. If you are teaching a Unit of Work covering history from prehistory to the 14th century, Gripping History will bring your topic to life. At Gripping History our preference is to discuss with you the needs of your children, your key learning objectives and shape these into a tailored programme for your school, although we have many suggestions to offer about suitable activities. All learning activities are supported by a range of artefacts for handling and exploration, and led by Cathy Murphy, an engaging teacher and experienced re-enactor. We are proud of our range of resources for teachers. Each resource contains a teacher pack, including child facing resources for activities. Also presentations to assist with delivery. They are written for teachers by teachers. 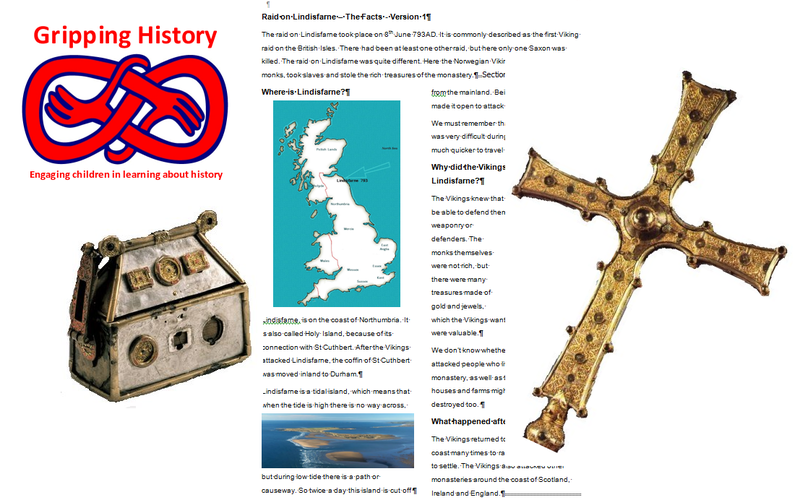 Resources include an interactive roleplay game focusing on preparing for a voyage, comparing sources on the Raid on Lindisfarne and exploring Saxon and Viking Place Names. Some of our downloads are free. Others have a small charge.